Get notified when Def Leppard tickets are available! Def Leppard is an English rock band that was founded in the year 1997 as a part of the British new wave heavy metal genre. 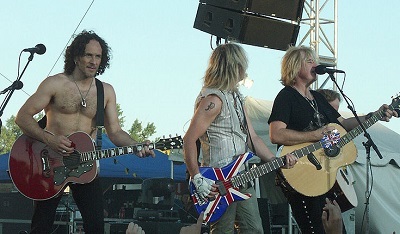 Since 1992, Def Leppard has had the members Rick Savage on bass guitar, Rick Allen on drums, lead vocalist Joe Elliott, and Phil Collen and Vivian Campbell on guitar. Their 1981 album High ‘n’ Dry featured the track “Bringin’ on the Heartbreak” that was one of the first-ever rock videos aired on MTV in 1982. Singles include “Pour Some Sugar on Me,” “Hysteria,” and “Love Bites.” To see these songs and more performed live, purchase Def Leppard tickets using the links above and mark your presence at one of their live shows!